To celebrate the 25th anniversary of the fall of the Berlin Wall, Airberlin is offering three sightseeing flights over Berlin during the evening of November 8, tracing the course of the former Wall. 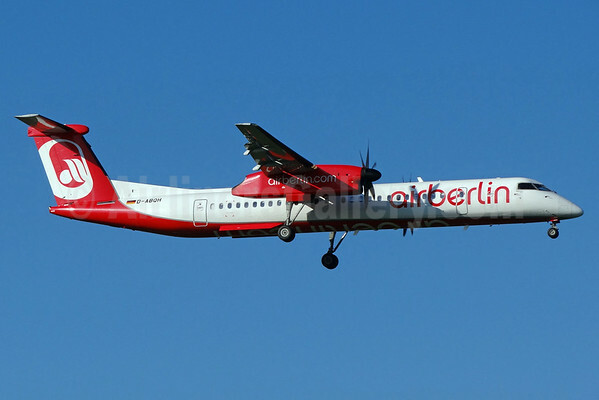 The flights are being conducted using a Bombardier DHC-8-402 (Q400) with a seating capacity of 76 and will operate between 5.30 p.m. and 8.30 p.m. from Berlin-Tegel Airport. They are accorded flight numbers AB 1989, AB 1990 and AB 1991, thus evoking the year of the fall of the Wall, the year of reunification, and the year of the relaunch of Airberlin as a German airline following the watershed events. From the particularly low flying altitude of approximately 1,000 meters (3,000 feet), the special flight passengers will be able to view the 15-kilometer-long ‘illuminated border’ made up of 8,000 luminous balloons stretching from Bornholmer Strasse to the Oberbaum Bridge. The light installation will illuminate a section of the former course of the Wall from November 7-9. An experienced city guide will accompany the special flights and narrate the history of the divided city of Berlin. On the ground, too, Airberlin is represented within a section of the ‘illuminated border’ at the East Side Gallery. In keeping with the airline’s anniversary, 35 balloon sponsorships were raffled via its social media channels, on its website, via international media and among staff. The sponsors will be present in person along this stretch during the evening of November 9 to release their helium-filled balloon from its mooring and, thus, to gradually give wings to the ‘illuminated border’. A further highlight on the afternoon of November 9 is to be the painting of two original sections of the Wall for Airberlin by the well-known French artist Thierry Noir. As early as in 1990, the artist designed sections of the East Side Gallery, nowadays considered protected monuments. Thierry Noir will complete work on the 3.6-meter-tall T-shaped sections live on the spot. The sections of the Wall will then be exhibited at the Berlin-Tegel Airport for a period of six months. The fall of the Wall is synonymous with a specific milestone in the 35-year history of Airberlin: while Germany was divided, only airlines of Allied nations were permitted to fly to West Berlin. Thus Airberlin, founded as an American charter airline named Air Berlin USA, was able to offer flights from West Berlin from 1979. Upon German reunification, the situation changed radically and Airberlin lost its air traffic rights. Only upon relaunch as a German airline in 1991 were the foundations laid for continued development to the status of the second largest German airline. Tickets for the special flights are available online at airberlin.com/fallofthewall at a price of 99 euros per person and can also be reserved around the clock via the company’s Service Center by calling +49 (0)30/3434 3434 (local rates apply). Since Sunday, October 26, 2014 all Airberlin Group flights have been taking off and landing at Milan Linate airport. The crew of flight AB 8406 from Dusseldorf, Alitalia employees and Airberlin ground crew greeted the first flights with an official “Benvenuto Linate”. The codeshare agreement between the Airberlin Group and Alitalia allows the airlines to offer their passengers a total of all the 412 nonstop flights of Airberlin, Niki and Alitalia between Germany, Austria, Switzerland and Italy under a joint flight number. Airberlin now operates two flights a day between the German capital and Abu Dhabi. On Sunday, October 26, Captain Christoph Runge and his crew manned the first of these doubled-frequency flights. At 11:30 o’clock, the Airbus A330-200 took off from Berlin-Tegel Airport with 226 passengers and 10 crew members on board with destination of Abu Dhabi. Finally in other news, Airberlin plans to cut another 200 administrative and ground staff in 2015. As previously mentioned Airberlin will continue to phase out its Boeing 737s and go to an All Airbus fleet. Copyright Photo: Paul Bannwarth/AirlinersGallery.com. Operated by LGW, Bombardier DHC-8-402 (Q400) D-ABQH (msn 4256) arrives at Zurich. This entry was posted in Air Berlin USA, Airberlin and tagged 4256, Abu Dhabi, Air Berlin USA, Airberlin, alitalia, Berlin, Bombardier, Bombardier DHC-8, Bombardier DHC-8-400, Bombardier DHC-8-402, Bombardier Q400, D-ABQH, DHC-8, DHC-8-400, DHC-8-402, Linate, Milan, Niki, Q400, ZRH, Zurich on October 29, 2014 by Bruce Drum.